CNAP Professional Certification Zinner & Co. Check back soon for 2019 CNAP class dates and fill out the form to stay up-to-date for information about our next certification offering. 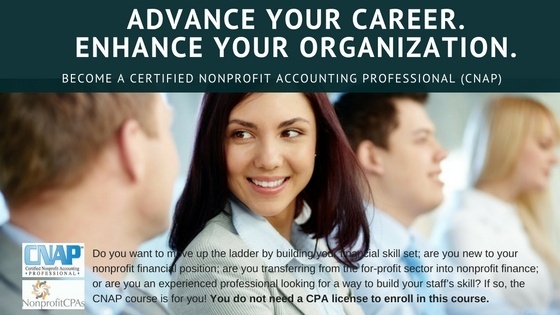 Do you want to move up the ladder by building your financial skill set; are you new to your nonprofit financial position; are you transferring from the for-profit sector into nonprofit finance; or are you an experienced professional looking for a way to build your staff’s skill and gain confidence in nonprofit accounting!? If so, our CNAP course is for you. Through a minimal time commitment, you will receive intensive training from individuals dedicated to serving nonprofit organizations. Best of all, you do not have to be a CPA to achieve this designation. The only nationally recognized certification program for nonprofit accounting professionals, CNAP earns high accolades from graduates for its comprehensive curriculum. It is the gold standard training for nonprofit financial professionals. Upon completion of the CNAP course, participants will not only obtain the CNAP Certification, but will have the ability to immediately apply their new knowledge against their organization’s capacity and leave the program with an action plan. By earning the CNAP credential, those in charge of the fiscal health of the organization will be properly trained, uniquely credentialed and highly resourceful to manage and meet funding, donor, and budget-driven deliverables. 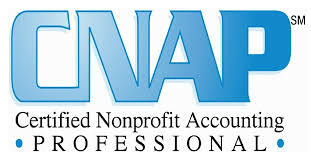 The CNAP designation is a nationally recognized certification developed and sponsored by the Certified Public Accounting and consulting firm members of the National Association of Nonprofit Accountants and Consultants (NPAC). The curriculum of this intensive program includes basic and intermediate accounting, as well as in-depth training on more advanced topics such as internal controls, current tax issues, IRS audits, lobbying, technology, and budgeting. Attendees will gain practical techniques that can be applied immediately, including ideas to improve the profitability of not-for-profits. Investing in and maximizing the knowledge and skills of existing staff within financial departments is a resource and meaningful investment for not-for-profits of all sizes. Zinner & Co. is the exclusive licensed provider of the CNAP designation in the Cleveland, Ohio area. *CPE credit available for CPAs. Pre-registration is open and seating is limited. To ensure adequate student-teacher interaction, we cap enrollment for our in-person CNAP courses at 50 students. Zinner & Co. will offer registrants a full refund for request made in writing no later than 15 days before the event. Requests made later than 15 days prior to the training will receive a refund of 50%.